With three of the goddess Durga's quests behind them, only one prophecy now stands in the way of Kelsey, Ren, and Kishan breaking the tiger's curse. But the trio's greatest challenge awaits them: A life-endangering pursuit in search of Durga's final gift, the Rope of Fire, on the Andaman Islands in the Bay of Bengal. 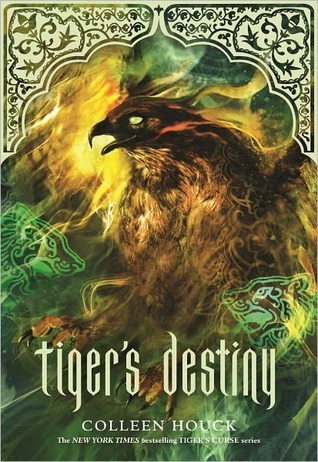 It's a race against time--and the evil sorcerer Lokesh--in this eagerly anticipated fourth volume in the bestselling Tiger's Curse series, which pits good against evil, tests the bonds of love and loyalty, and finally reveals the tigers' true destinies once and for all. As you've seen on my blog reviews for this series, there were a lot of problems that couldn't be ignored and had to be addressed. The story for each and every one of the books is spectacular. They're such original ideas and put the imaginative cells of my to work, but the faults do happen to make the overall story less enjoyable. Kelsey, for example, had many lessons to learn. She was not a very likable character and even in this book, I did not like her personality. Her constant denial and naivete annoyed me to no end. Also, I wish she would just make her mind up over which guy she wanted. There was too much testosterone going on with the brothers for my taste. However, what I did like with the end of this book was the fact that all of the lessons that Kelsey had to learn were huge slaps in the face. She learned that her destiny wasn't what she had thought it to be and there was a type of satisfaction that came with it. As always, the story itself was the most interesting part of the book. There was so much action and adventure that I couldn't even explain it all in this review. First, they set out to retrieve the fourth and final gift from Durga. To do that, they end up in this other world that happens to be inside of a volcano. Lots of action and adventure ensue and then they end up . . . wait for it . . . TIME TRAVELING! I don't want to spoil anything, so I'm not going to say much about it other than it was very, very interesting to read about. Then, more action and adventure took place and the book ended. I also found it interesting how events and hints dropped in previous books played full circle in this one. I feel as if Houck's writing abilities improve with each book. The first book was terrible, writing skills-wise. I was still cringing throughout the series, Tiger's Destiny included, but it wasn't as cringe-worthy as the first. There were just these moments that would be so awkward that bothered me. Why, oh why, do things have to be written in such an uncomfortable manner? In addition, the lack of imagery wasn't as big of a problem as it was for the others of this series. I found that it was a lot easier to picture things in my mind in this book, and that was a good thing. Imagery, I feel, is such an important part of the book, so when an author totally neglects it or butchers it to bits and pieces, it makes my heart sad. Luckily, the imagery was okay or I would have been fuming. The Tiger's Curse Series and me have had a very turbulent relationship. We've had moments of smooth flight (the things that I liked) and we've also had moments of near-crashing experiences (the things I didn't like). The ending was not at all what I thought it to be and I must give some kudos to Houck for that. I didn't know that I had created some type of character-reader attachment, so when the end came on a very bittersweet note, I actually cried a little. The action, adventure, and originality of Tiger's Destiny is what made me enjoy the book, but it's unfortunate that I couldn't have given this book more praise because of its many faults.